Cardin's whitefly, Metaleurodicus cardini (Back), has been known in Florida since 1917. It was originally described from Cuba and was named for Professor Patricio Cardin. 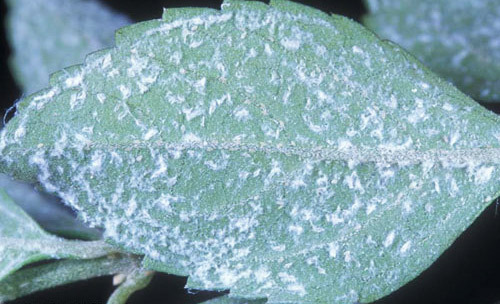 This whitefly is usually innocuous, but under some situations can become a damaging pest. These situations usually occur when something has disrupted the parasite/predator complex. Figure 1. An infestation of Cardin's whitefly, Metaleurodicus cardini (Back). Photograph by Lyle J. Buss, University of Florida. Metaleurodicus cardini (Back) [Bondar, 1923: 81]. Aleurodicus cardini Back, 1912: 148-151. Aleurodicus (Metaleurodicus) cardini Back [Quaintance. & Baker, 1913]. While it is known from Gainesville (north central Florida) to southern Florida, it is much more common in subtropical areas. Within the U.S., it is also found in Hawaii, near Hilo on the island Hawaii (HDA 2006). This species is also known from Bermuda, Cuba, Dominican Republic, Haiti, Jamaica, Puerto Rico, and the Virgin Islands (USDA 2006). Adults: The adults are greenish yellow with a fine dusting of white wax. Their wings are somewhat dusky with a conspicuous dark spot near the center of each wing. As females deposit eggs, a fine trail of fluffy white wax is rubbed from a tuft of wax on the underside of the abdomen. Figure 2. Adult Cardin's whiteflies, Metaleurodicus cardini (Back). Photograph by Lyle J. Buss, University of Florida. Figure 3. Fluffy wax trails, especially along leaf veins, deposited by adult females of the Cardin's whitefly, Metaleurodicus cardini (Back). Photograph by Lyle J. Buss, University of Florida. This species is similar to Metaleurodicus arcanus sp. nov., but Metaleurodicus cardini can be separated from Metaleurodicus arcanus by its four abdominal compound pore pairs compared to five in Metaleurodicus arcanus. Also, Metaleurodicus cardini has a submarginal row of eight shaped pores that Metaleurodicus arcanus sp. nov. lacks (USDA 2006). Figure 4. 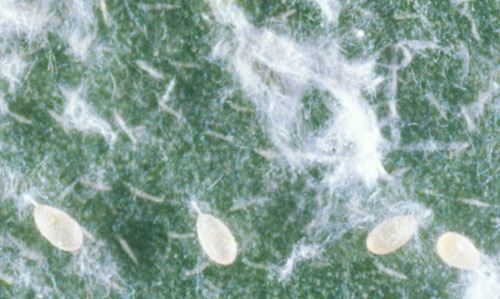 Eggs of the Cardin's whitefly, Metaleurodicus cardini (Back). Photograph by Lyle J. Buss, University of Florida. Figure 5. 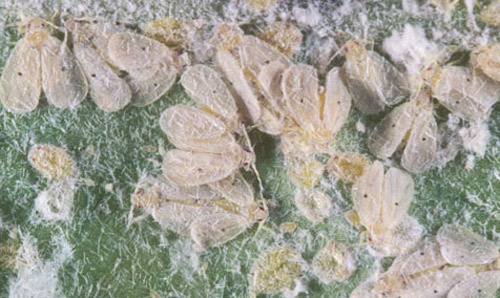 Nymphs of the Cardin's whitefly, Metaleurodicus cardini (Back). Photograph by Lyle J. Buss, University of Florida. Pupae: The pupal cases are just short of 1 mm long and 0.6 mm wide. They are elongate-oval in shape and elevated on a vertical marginal waxen fringe. Pupal cases are yellowish-white in color and are semi-transparent when empty. Parasitized pupal cases are blackish throughout or in spots (Back 1912). Figure 6. Two pupae of the Cardin's whitefly, Metaleurodicus cardini (Back). The photograph also shows two winged adults in the lower center and left and two nymphs (more of an orange color), one in the upper right and a second, smaller one, directly below it. The two pupae (one between the adults and the topmost nymph, and the other to the right) are yellowish-white and have red eye-spots. Photograph by Lyle J. Buss, University of Florida. Figure 7. The pupal case of the Cardin's whitefly, Metaleurodicus cardini (Back), in the upper left is probably parasitized due to its blackened color. Compare it to an unparasitized nymph in the lower right of the photograph. Photograph by Lyle J. Buss, University of Florida. The dorsum of the pupal case has five pairs of large compound pores with a reduced number of locules. Smaller pores with a star-shaped internal matrix are scattered over the dorsal surface. A row of bilocular wax pores are present around the dorsal submargin. The vasiform orifice is subcordate in outline, with the cephalic margin straight, and the operculum is somewhat rectangular in shape. The lingula is spatulate, slightly exserted and armed with four long setae (Quaintance and Baker 1913). The adult is distinguished readily from all other whiteflies known in Florida by the distinct dark spot on each wing. The pupal case will require a microscope slide preparation for identification to species. The pupa is separated from other Florida species by the four pairs of abdominal cup-shaped compound pores with reduced loculi, and the 5th pair on the cephalic segment. The only other species of this genus known in Florida, Metaleurodicus griseus (Dozier), has six abdominal pairs of compound pores, and occurs only on Eugenia spp. in Florida. 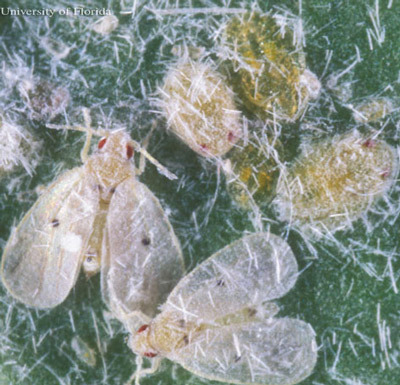 A key that covers 16 species of whiteflies that may infest Florida citrus is available online. 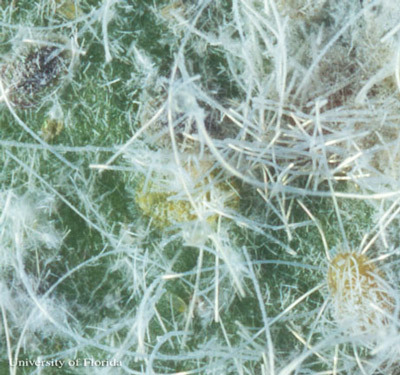 The key, developed by the Florida Department of Agriculture and Consumer Services - Division of Plant Industry (FDACS-DPI), uses color photographs of nymphs to assist in identification. It is available here. The most common host in Florida is Psidium guajava. Other hosts from FDACS-DPI files are: Citharexylum fruiticosum, Dipholis salicifolia, Duranta repens, Eugenia sp., Malpighia glabra, Melaleuca quinquenervia, Paurotis wrightii, Pimenta dioica, Pimenta officinalis (USDA 2006), and Plumeria sp. Additional hosts from the literature are Citrus sinensis and Citharexylum spinosum (Mound and Halsey 1978). Inspect the undersides of leaves for white fluffy wax trails, pupal cases, and adult whiteflies with a dark spot on each wing. This is only whitefly in Florida easily identified from the adult. Chemical control. 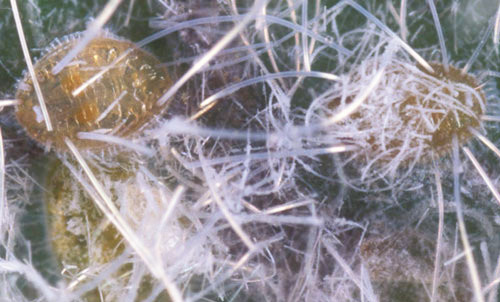 Whiteflies are controlled by sprays targeted for control of scale insects. Spraying of commercial citrus exclusively for whitefly control is seldom practiced in Florida. Recommended control measures for commercial or dooryard citrus are significantly different. Please consult the specific management guide for your situation. Biological control. Natural enemies include: Delphastus diversipes (Champion) (Coleoptera: Coccinellidae), Ocyptamus parvicornis (Loew) and Pseudodoros clavatus (Fabricius) (Diptera: Syrphidae), Encarsia sp. (Hymenoptera: Aphelinidae), Caraeochrysa cincta (Schneider) and Chrysopodes collaris (Schneider) (Neuroptera: Chrysopidae) (USDA 2006). Back EA. 1912. Notes on Cuban whiteflies with descriptions of two new species. Canadian Entomologist 44: 145-153. Bondar G. 1923. Aleyrodidos do Brasil. Bahia: 81. Mound LA, Halsey SH. 1978. Whitefly of the world. British Museum (Natur. Hist.) and John Wiley and Sons, Chichester. p. 244. Quaintance AL, Baker AC. 1913. Classification of the Aleyrodidae Part I. Technical Series Bureau of Entomology U.S. 27: 75-77. Originally published as DPI Entomology Circular 316. Publication Date: September 2000. Latest revision: June 2014. Reviewed: December 2017.